NATO has agreed to relieve the United States of responsibility for enforcing the no-fly zone in Libya. The announcement came on the same day that Libyan strongman Moammar Gadhafi challenged the no-fly zone, only to see one of his few remaining planes destroyed by a French jet. In acknowledging the transition to a NATO command, Secretary of State Hillary Clinton this evening highlighted the successes of the no-fly zone's initial U.S.-led phase. "After only five days, we have made significant progress," she said. "A massacre in [the Libya rebel stronghold of] Benghazi was prevented. Gadhafi's air force and air defenses have been rendered largely ineffective. And the coalition is in control of the skies above Libya." NATO Secretary-General Anders Fogh Rasmussen waited to announce the new NATO role until every one of the 28 NATO members agreed to have NATO take over management of the no-fly zone. Turkey, the only predominantly Muslim NATO member, agreed to the switchover today, according to The Associated Press. Non-NATO members also are expected to take part in the enforcement action, including members of the Arab League. "This evening, the United Arab Emirates announced they are joining the coalition and sending planes to help protect Libyan civilians and enforce the no-fly zone," Clinton said. " We welcome this important step. It underscores both the breadth of this international coalition and the depth of concern in the region for the plight of the Libyan people." Qatar is another Arab nation that reportedly will contribute assets to the operation. The no-fly zone order will go from the NATO Council to Adm. James Stavridis, NATO supreme allied commander, on down the chain to the component commanders. On Wednesday, NATO announced it was taking responsibility for enforcing the naval arms embargo for Libya. The United States will remain part of Operation Odyssey Dawn, but will have limited participation, Africa Command's Gen. Carter F. Ham told ABC News in an exclusive interview. The U.S. will contribute tankers and personnel recovery teams, he said. "The phrase that we use is that the United States will contribute its unique military capabilities to whatever this second phase of operation would be," Ham said. "There's probably some intelligence support that we would continue to provide, some communications, tankers for aircraft. ... But we wouldn't see probably a large number of fighter aircraft for example." Ham said he's confident the command can be handed over "relatively quickly" but "there are frankly some mechanical and procedural pieces -- particularly with regard to the air operations -- which are very, very complex" that may take a longer while to transition. Some allies only want to enforce a no-fly zone but not protect civilians, which would entail firing on ground forces, Ham told ABC News. Coalition forces are sorting out details, he said. Gadhafi's challenge to the no-fly zone ended quickly today, said the French government. Gadhafi forces sent a warplane over the city of Misrata, where it was quickly destroyed by French fighter jets. According to the French Ministry of Defense, stealth fighters were alerted by an AWACS surveillance plane that the Libyan jet was airborne over Misrata . The galeb -- a single-engine military aircraft -- that was violating the no-fly rule apparently quickly landed, but that didn't save it. "The French patrol carried out an air-to-ground strike using an A2SM missile while the fighter jet of Colonel Gadhafi's forces had just landed at the military base in Misrata," the French statement said. Ham told ABC News that Gadhafi's forces are advancing in the northwest city of Misrata, with his men dressing as civilians. Ham said there are still plenty of command and control centers left for the allied forces to target. Gadhafi is aware there will be a transfer of power from the United States in the coming days, Ham said, and the embattled leader seems to think he will wait it out until the United States no longer has command. He said the coalition is targeting fewer fixed sites and focusing more on targeting Gadhafi's ground forces that are besieging cities across the country. "Early on in the campaign, we were targeting air defense command and control systems, weapons sites, those kinds of fixed sites and we are doing less of that and we are doing more what we call dynamic targeting -- regime ground forces that are engaging civilians in a number of cities across the country," Ham said. The most challenging task, however, has been protecting civilians, Ham said. "We remain very, very conscious and very careful about civilian casualties. It's very difficult to assess what the effect of an attack might be in those built-up areas and secondly it's difficult to distinguish between opposition forces and regime forces," he told ABC News. "It's very difficult to discern who is attacking who in those very complex situations. It is the toughest thing we have to do right now and we're working very hard to do that." The Tomahawk missile strikes have effectively degraded Libyan air defenses to the point that the coalition has not recorded any radar activity coming from Libya. No Libyan planes had flown since the start of the operations on Saturday but the threat from Gadhafi is not over. Gadhafi's Bab Al-Aziziya compound in Tripoli was struck again by coalition forces overnight for a second time. The compound was originally hit on Sunday by two British tomahawk missiles. The latest strike on the Al-Aziziya compound was not a pre-scheduled target, a U.S. official said. Instead, it was more likely an opportune target, in that the pilots did not go out intending to target the compound, but may have seen something worth attacking, the official said. Rebels continue to fight though they remain besieged by Gadhafi's forces. In Ajdabiayh, just west of the rebel stronghold of Benghazi, rebels bombed Gadhafi's outposts. Fighters armed with anti-aircraft guns held up peace signs, which has become a symbol of this revolution. "Gadhafi's forces are weak and isolated," said one man confidently. "We need heavy weapons and aerial support to confront their tanks." But Gadhafi's forces are still firing away, not giving in. An anchorman on state TV brandished an AK-47 and declared he was ready to die for the colonel. Representatives from countries that are part of the coalition will meet Saturday in the United Kingdom to form a "contact group" to continue the intervention in Libya. But there's still much confusion and disagreements among the allies on who will take command. The debate over who should take over enforcing the no-fly zone had exposed frictions within the coalition. In the United States, there has also been a vigorous debate about the lack of an end mission. Ham said that while it would be ideal to have the end goal defined, it's not surprising that it's only coming into the discussion now, considering how quickly allied forces had to act. "We could have and obviously would have been nice to have the longer debate about eventually, what do you want to get to, what would we like to see the international community support in Libya," Ham said. "But he [Gadhafi] was slaughtering his own people. I don't think you can't stand by and have that debate about end state while he is killing his own people. By that point, it may have become a moot point." 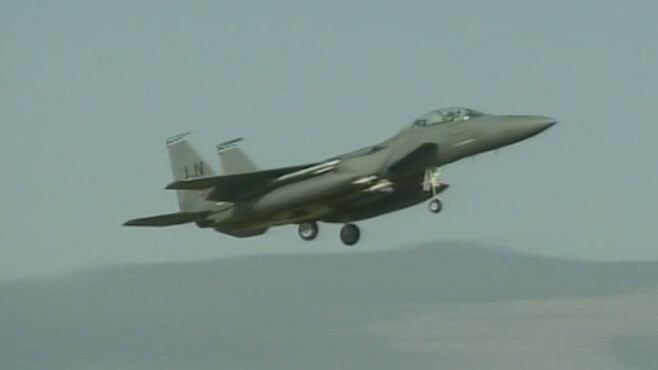 The Pentagon on Thursday said that the total number of sorties was 175 with the number of non-U.S. flights increasing. They're targeting tanks, rocket launchers, artillery, as well as ground forces but only those operating outside of cities, pushing into Misrata, Zawiyah and Ajdabiyah. U.S. officials say Gadhafi's allies have been reaching out to his partners across the world, but on the surface, the longtime dictator has been defiant. U.S. officials tell ABC News that Gadhafi is increasingly anxious, constantly on the move and not knowing who to trust -- though he is being encouraged to stick it out by at least one of his sons. "Gadhafi is not sleeping. He oscillates between crazy and then some sanity," a U.S. official said. "He is emotional and moving around a ton." Clinton told ABC News Tuesday that there's evidence the embattled leader, through his people, is reaching out to allies around the world exploring options. "Some of it is theater. Some of it is, you know, kind of, shall we say game playing, to try to do one message to one group, another message to somebody else," Clinton said. "A lot of it is just the way he behaves. It's somewhat unpredictable. But some of it, we think, is exploring. You know, what are my options, where could I go, what could I do. And we would encourage that." ABC News' Huma Khan and Luis Martinez contributed to this report. +U.S. Ready to Hand Off Libya, But to Whom?